Stop and go driving conditions cause carbon accumulation in the exhaust passages leading to the EGR valve. 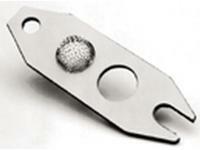 When these particles break loose, they can be lodged between the EGR valve pintle and its seat. The result is rough idle and stalling. 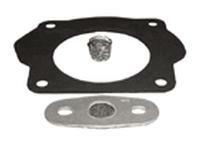 Tomco's EGR gasket replaces the original equipment type gasket. The heat resistant filter screen catches these particles before they can cause trouble.